Before spending some time looking at the D1 Divisional Round in Mobara we were in the middle of last weekend's Tokyo Drift Exhibition coverage, held in Odaiba. To wrap things up I want to go back and check out some more action from this event, one that does a great job of promoting drifting to the masses. The House Nation Dancers where busy signing autographs and posing for pictures around the paddock for most of the day. 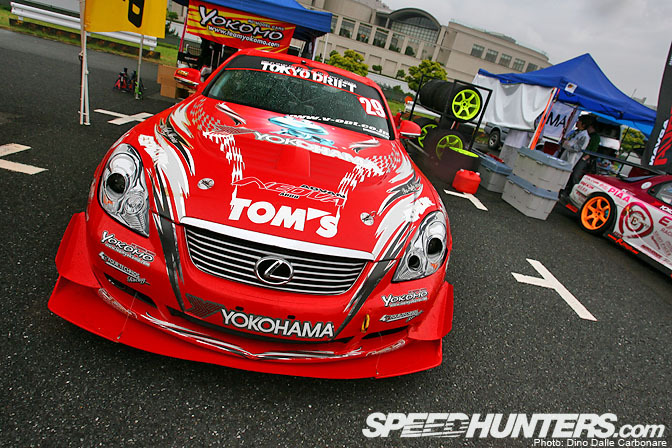 It is exactly one year since DRoo-P introduced the Lexus SC drift machine. Originally it was Yoshioka's new car but after his move to compete in the US D1 series it is now being driven by Kazuya Matsukawa. This UZZ40 is without a doubt one impressive machine built from the ground up just like a race car. The 600 PS 2.2L 3S -GTE that powers it is mated to an X-Trac sequential transmission sourced from the Super GT Soarer. Here is "The Sheriff" blasting out of the pits for the warm-up session. I'm really hoping that more drifters from around the world come and participate in D1 here in Japan, it injects even more excitement to the action. When I was chatting to Federico at the end of the day he was already a star, with Japanese and foreign fans coming over for autographs and pictures. …ending up in the barriers. After 3 impacts over the week-end the Aristo looked like it was in need of some TLC. Better luck at Okayama Orido-san. 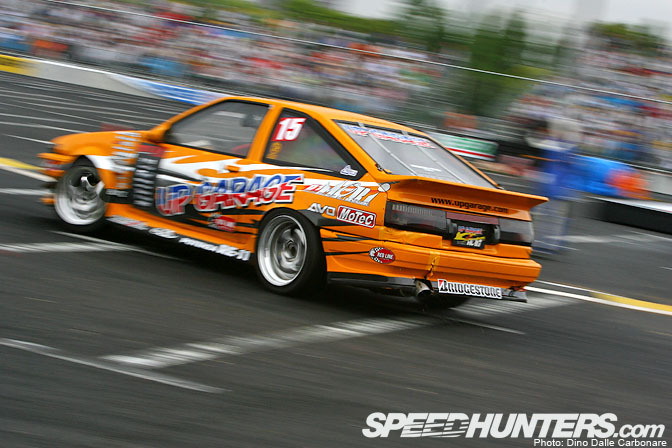 With more and more people in drifting moving away from the AE86 I take my hat off to Ken Maeda for sticking with his hachiroku for so long. I'm sure it is not an easy choice, with the average power of D1 cars going well beyond the 500 PS mark! …and then took her for a ride. She was obviously loving it and the crowds were too! Next to Murayama's cool Skyline down in the temporary pits was Haruyama's C35 Laurel, a car we should really do a feature on this year. The freshly re-painted body is also joined by a fully tuned RB26, which thanks to that rather large Blitz/KKK K5-700R turbine, develops 580 PS. The attention to detail of D1 cars is getting very high, until a few years back you would only find clean engine bays like this on show cars. 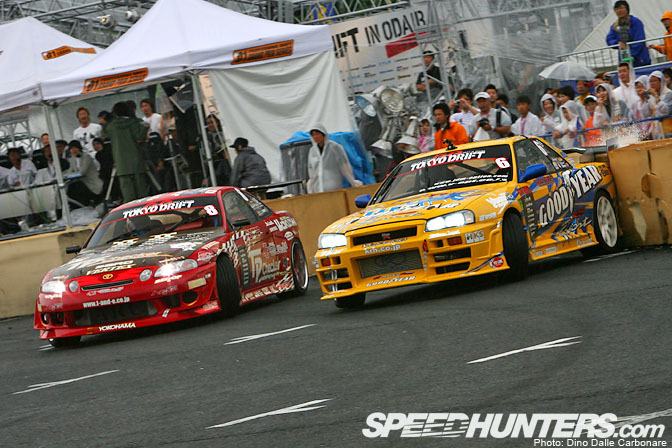 Tezuka softly scraping the rear of his R324 along the foam barriers, while Ueno tries to keep up in his "out of retirement" Soarer! The driving was as close as ever, despite the slippery conditions. 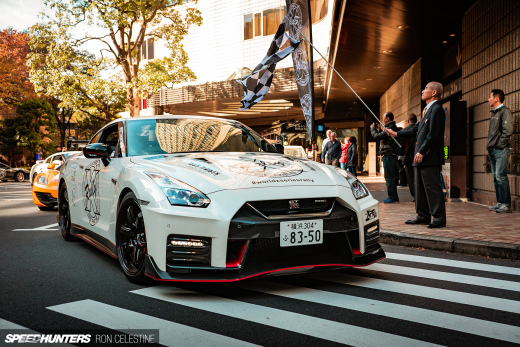 I hope you guys enjoyed the coverage from this year's Tokyo Drift exhibition. And don't worry, you will be getting your JDM drifting fix sooner than you think, so stay tuned for more sideways action form Japan. That purple laurel is intense! Love the way they've tied it all together. Beautiful shots, thanks for keeping us up to date on events happening on an international scale! "was Haruyama's C35 Laurel, a car we should really do a feature on this year. " Yes, yes, Mr. Dino! 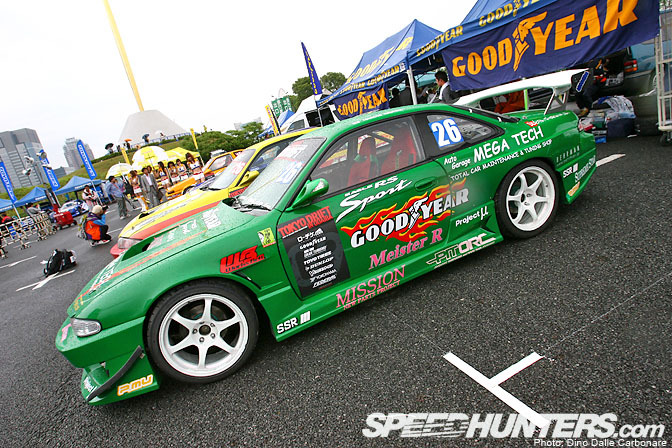 Those wheels on Kuniaki Takahashi's JZX100 look very awesome. Anyone knows what are those? I believe they are Weds something, or maybe some XD9. Please please more C35 Laurels! 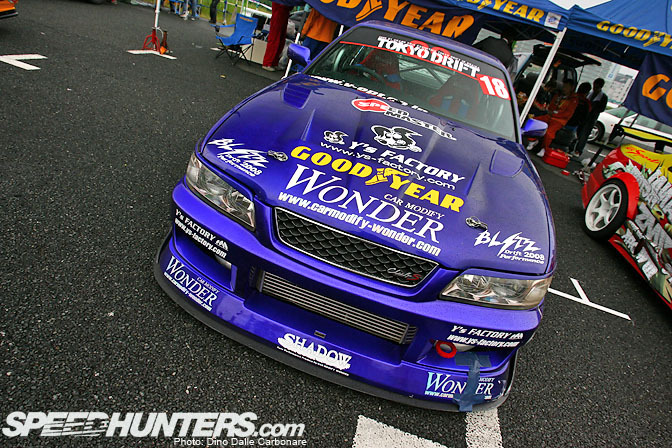 Last shot is of Murayama's S14, use to be bright orange and he use to have a orange 180sx until it got stolen!!! I wish more people would build C35's. The C35 is one of my favorite sedans, so elegant! Great pictures, good update on whats going on. I like all the pictures but mf fav has to be Yuki from Move throwing her hand out the window. nice capture. Damn Dino you always take good shots you are a very good photographer Nice work keep it up. 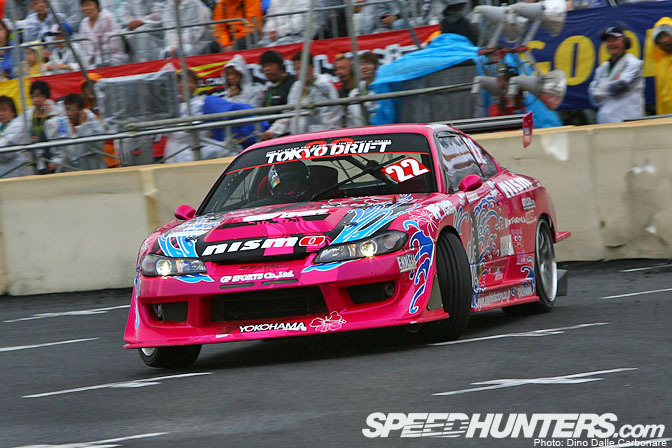 Great pictures, the Pink Silvia looks great! 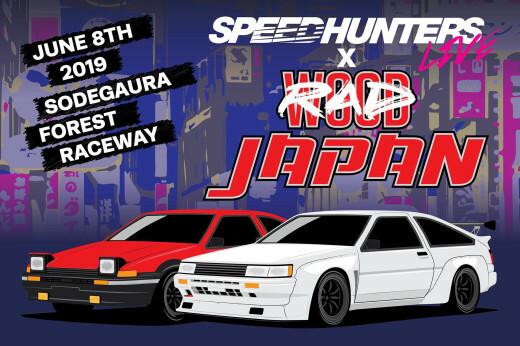 I wish there was an event like this in the UK! 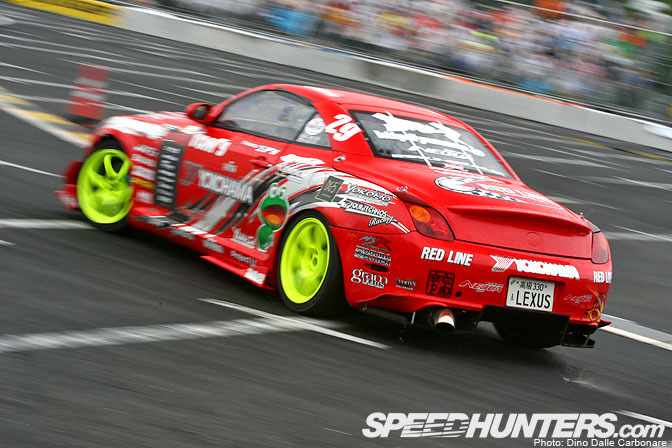 I'd love to see live drifting in London or Edinburgh!! Actually her name is Yuri , and yes she's so damn cute!